Is your home as efficient as it could be? Are you using Richmond VA thermostat controls to make sure that your house is kept at the right temperature when you’re not home, and that you’re saving money when you are? It’s ironic that home automation and home theater installation are often thought of as premium renovations or upgrades, when being smart with Fredericksburg HVAC controls can help homeowners save significant amounts of money month after month and year after year. Through active power monitoring, systems installed through Appalachian Home Technologies can divert resources from rooms or appliances that aren’t in use and save you hundreds in the process. Additionally, our Charlottesville thermostat controls can be used to maximize the gains from solar panels and other alternative energy sources. Whether you’re simply trying to supplement your power supply or sell electricity back to the utility company, we can ensure that you get the most from your green energy investment. And best of all, Washington DC thermostat controls can be installed right along with your other home automation upgrades. 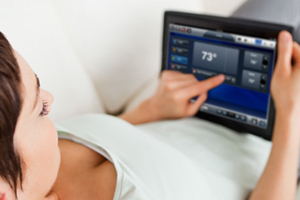 With the right Richmond VA HVAC controls, you don’t have to choose between being efficient, lowering energy costs, and enjoying perfect comfort within your home. With just a little bit of smart home technology, you can enjoy all three. So, when you contact the AHT team about a home theater installation or security system, don’t forget to look into Washington DC thermostat controls at the same time. If you aren’t using modern technology to save on electricity, heating, and cooling, be sure to talk to us about Charlottesville HVAC controls today.